Hog Deer (Axis porcinus)Appearance: The Hog deer is the smallest deer in Australia and are very rare. Their common name derives from their low, heavy build and their pig-like running style. At some times of the year the males may show spots along their back which will fade after a few months. As is suggested by their Latin name, they are a relative of the Axis deer (Axis Axis). Weight: 36-45 kg’s (80-100 lb’s). Antlers: 3 points a side with the second tine on the inside of the main beam. Trophy size: Representative trophies range from 12 to 15 inches in length. 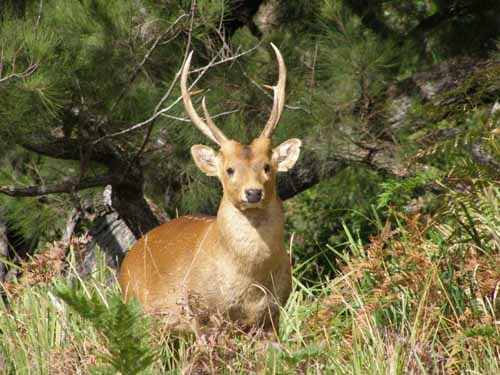 History: Hog Deer from Sri Lanka (Ceylon- now considered extinct in this part of their native range) were introduced to Australia in 1860. Hunting Hog deer: They are an excellent game animal and a small and difficult target. Alert and wary, they can quickly disappear into thick cover or tall grass. Hunting is best done from a stand or hidden vantage point. Like many tropical deer species they have no clearly defined rut.